With the large number of white cards in M13 and Avacyn Restored, I thought I’d briefly talk about Vigilance; it is a virtue, after all. 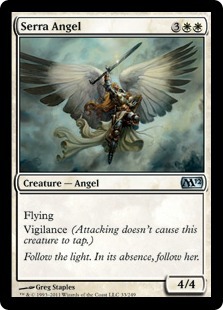 Vigilance is one of the older mechanics in Magic, originally introduced in the first set ever, Alpha. However, its ruling was simply written out prior to Champions of Kamigawa, where it was introduced as an actual keyword. Vigilance was originally written (and the ruling is still written) as: Attacking doesn’t cause this creature to tap. 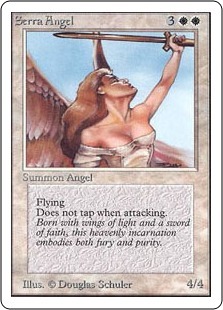 As seen here, this is a Serra Angel from Unlimited right next to a newer Serra Angel from M12, the last core set. These are the same card, but the original does not have the Vigilance keyword. Vigilance is a very basic ability, but still very important. It’s present on many cards in our current format, such as Sun Titan. Game and Mechanics – A New Series, Beginning with Exalted! Well, SolemnParty is back. I’ve decided that I’m returning to write a few series of my own. As of right now, my first new addition to the site is Game and Mechanics. Seeing the return of Exalted, I’ve decided I’ll mention a few things and eventually cover everything from Horsemanship to flying, from banding to wither. All of this will reveal itself in time, of course. Exalted as MTGSalvation states, was originally introduced in the realm of Alara, starting with Shards of Alara and continued through Conflux and Alara Reborn. As of Magic: 2013, Exalted is returning in full force. While the ability doesn’t make it self evident, if multiple cards have exalted and one creature attacks, each card gives that creature +1/+1 until the end of the turn. For example, a 1/1 attacks, but you have 7 cards with exalted on the board, that 1/1 becomes a 8/8 because it is attacking alone. Here’s one of the best examples for the fact that even non-creatures can have exalted. With this land in play, any creature that attacks alone will have that +1/+1 bonus until the end of the turn. Even though it comes into play tapped, that isn’t really a huge deal due to the fact that it doesn’t need to be untapped to have exalted, it’s an instant +1/+1 when it hits the board as long as you attack alone.